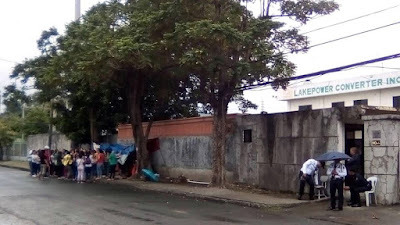 Women workers of the electronics company Lakepower Converter Inc. at the Cavite export zone have been on strike since December 7 and were repeatedly harassed by company and ecozone guards. Company guards, export zone security guards and other men wearing ski masks but clad in ecozone police uniforms repeatedly tore down placards and makeshift tents at the picketline. The men arrived in motorcycles and bearing side arms. Two women workers—Maricar Orque and Magdalena Peña—were hurt in the commotion that followed the forcible dismantling of the picketline. The strike commenced after management refused worker’s demands that the termination and suspension of union officers and members be stopped. Unrest has festered at Lakepower for the last few months. Among workers grievances is the removal of the door of the women’s restroom so that the company can spy on workers. Almost all of the 200 workers in the factory are women. They are also outraged at the unreasonable limits on the use of the restroom which has led to numerous cases of workers suffering from urinary tract infection. Workers are also complaining of excessive quota and the exclusion of unionists from receiving Christmas packages. Workers formed a union around June this year in a bid to resolve various workplace grievances such as verbal harassment, health and safety, and excessive quota. In response, management interrogated workers individually regarding their union activity. Union leaders were given new work assignments and overtime work was denied unionists and instead given to contractual employees. Three line leaders were forced to resign since they were suspected union supporters. The union filed a case for union busting and unfair labor practice. In the mediation proceedings convened by the Labor Department, management promised to respect freedom of association and acceded to union demands that the company post a memo that it will not interfere in the right to unionize and prohibit management personnel from talking to workers about union activities. However, management interference did not stop but merely changed its form. A company union was formed at the instigation of management. The company union intervened in the union’s petition for certification as sole and exclusive bargaining agent. As a result, the petition was dismissed but a certification election was ordered Labor Department. This October, a certification election was finally held and the real union garnered more votes than the company union. This was despite management interference in the elections such as granting “cash productivity bonuses” to favored workers which was effectively vote buying for the company union. After elections, management continued its discriminatory behavior against unionists. Unionists were served disciplinary charges on flimsy grounds such as allegedly taking too much time in the restroom while members of the company union were left untouched. With the looming declaration of the real union as the certified bargaining agent for the workers, the company then terminated the union president and five other union officers and members on the basis of flimsy reasons. Afterwards management also suspended scores of other union officers and members for alleged infractions going back months ago. These discriminatory acts precipitated the December 7 strike. Lakepower is 100% Taiwanese owned according to the records of the Philippine Economic Zone Authority and exports all of its production to Coil Technology Corporation (CTC) that is based in Kaohsiung City, Taiwan. Lakepower and CTC are suppliers to Texas Instruments, Arrow Electronics, Recom Power and A.M. Components. Striking women workers are calling on these companies to enforce their commitment to respect the right to unionize and freedom from discrimination all along their supply chain.